Until the late 19th and early 20th Centuries, men who needed to know the time and who had the money to afford a watch, kept it in their pocket on a chain. Women, for some reason, were the trailblazers – Elizabeth I had a small clock she could strap to her arm. It is not true that wristwatches were invented specifically for World War One – but it is true that their use by men took off dramatically. 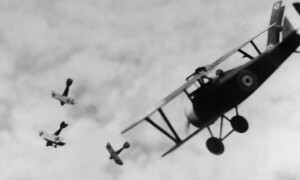 After the war, they were the usual way to tell the time. As timing in war became more important – so that artillery barrages, for example, could be synchronised – manufacturers developed watches which kept both hands free in the heat of battle. Aviators also needed both hands free, so they too had to throw the old pocket watch overboard. It was WW1 which really established the market for wristwatches. In particular, the “creeping barrage” meant that timing was everything. This was an interaction between artillery firing just ahead of infantry. Clearly, getting it wrong would be fatal for your own side. Distances were too great for signalling and timings too tight, Wristwatches were the answer. The very first watch that somebody adapted to wear on a wrist is unknown. The first series of purpose-made wrist watches was produced by Girard-Perregaux in 1880 for the German Navy. 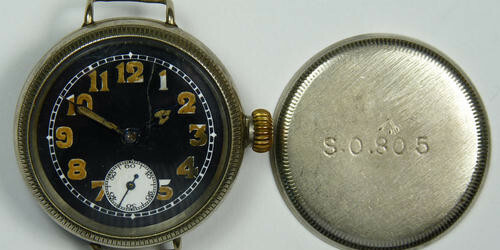 During World War I numerous companies, including Omega, Longines and others produced wrist watches for the military. These watches were of virtually identical style with an enamel dial, wide white numerals, and a luminescent hour hand. Often they did not bear the name of the manufacturer, though the movement, originally designed in the 1890s for ladies’ pendant watches, was marked “Swiss”. 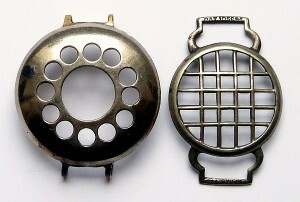 From pocket watches those trench watches inherited hinged front and back covers. The lugs for a strap looked like a thick wire attachment to the classical round shape of pocket watches rather than an integrated part of the body of the later and modern wrist watches. The name “wristlet” was used until the early 1930s and was eventually replaced by the modern name “wrist watch”. Even one of today’s iconic luxury watches goes back to WW1. Cartier’s Tank Watch originated in 1917 when Louis Cartier, the French watchmaker, saw the new Renault tanks and modelled a watch on their shape. Kinda neat! There’s some watch trivia I had not known before. (And something else to look out for to purchase…) Thanks Mark! 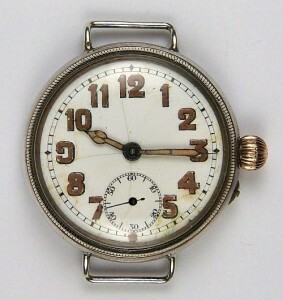 Mark, I really like you blog posts about different watches, especially this one on WWI watches. Have you ever worked on a WWI watch? Mark: Great article on the history of wrist watches. Always enjoy reading the watch articles and information in your newsletters. This article is interesting to read. It provides a deep knowledge into the early history of watch making. The so called “wrist watch” as of present time has undergone so many changes with different names and models. What a wonderful thing to know! Thank you Mark for this article. Have a great weekend. Enjoyed your article a lot. Have you ever provided more information on the clock used by Elizabeth I? How did you find that information? Thanks for the wonderful information.